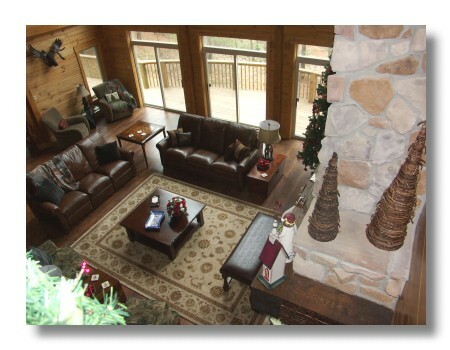 Step into the Gathering Room of this great 3 story log vacation lodge. The main level of this vacation home includes a gourmet kitchen and formal dining room, a great room with floor to ceiling windows and magnificent stone fireplace, and a master bedroom suite. Enter the Master Suite on the main level of Eagles Nest from the Gathering Room. This master suite has a King Bed and a private Hot Tub on the deck Outside. Don't forget the Porch Swing off the Master Suite. What a great place to relax after a jam session at Bean Blossom Bluegrass Music Park. 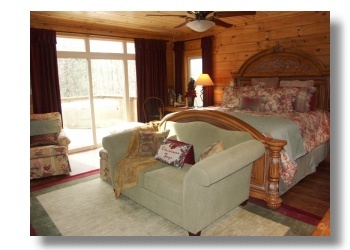 This romantic master suite is the perfect get-away space in the perfect get-away lodge, tucked into the woods in Brown County Indiana. Just down the road from the Bean Blossom Bill Monroe Bluegrass Music Hall of Fame and Jamboree. 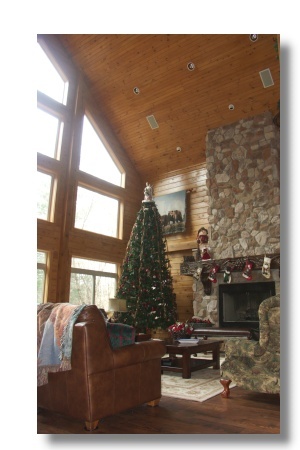 If you are a bluegrass music fan, this is the cabin for you!